The Ink Trap: A new challenge Art Impressions: Sheer Perfection! A new challenge Art Impressions: Sheer Perfection! Hey all! Welcome to a brand new challenge at Art Impressions! This go round we're asking that you create using vellum in your project. True confession time....I don't normally use vellum all that much, so when this challenge came up, I had to go on an expedition in my craft room to locate some...LOL! Seriously, it was like an archeological dig! I knew I had some, the challenge was locating it. I finally came up with a brand new package, but it was yellow. I'm not sure it if was yellow due to age or if that was the actual color. Can't remember why I would need a whole package of yellow vellum...LOL! Oh well, beggars can't be choosers ;) I know you will have better luck. Once I found my vellum, I wasn't sure how to incorporate it into my card. I considered making a rolled flower, but settled on using it to create a soft, subtle layer behind my image. 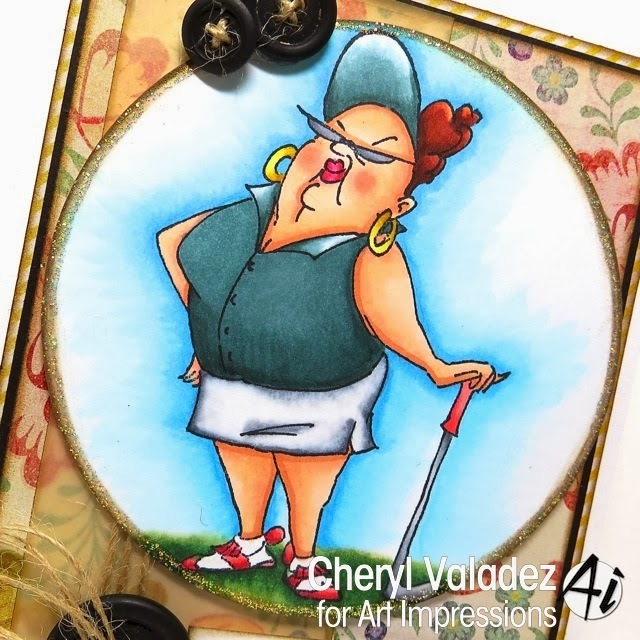 Speaking of my image, I used the sassy Lady of the Links, Goldie the Golfer. You can find Goldie in the Art Impressions Shop along with a HUGE assortment of wonderful images, so do pop in for a look-see. OOF! Just remembered there's a time change this weekend. Don't forget to move your clocks forward one hour. Not my fave movement on the clock, because I feel cheated in the sleep area, but I do love the extra hour of daylight in the evenings. Oh well, can't have everything! Ms. Goldie is just stunning there on the golf course Cheryl. Your coloring is so wonderfully blended and I really like the way you did the shadowing around her. The glittery border is fun too. Been playing around with your blond hair color combo ever since I watched your video. I really like it. :-) Hugs!